Events hosted all week by the Academy of Motion Picture Arts and Sciences honored the nominees and took audiences behind-the-scenes. The various events featured nominees for Documentary Feature and Short, Animated Feature, Foreign Language and Makeup. 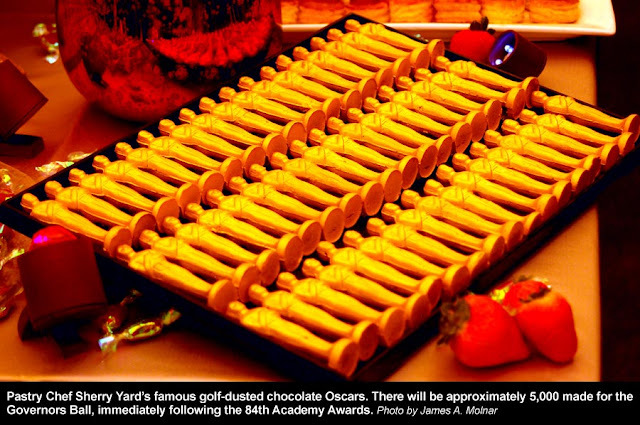 Various “symposiums” were open to the public and sold out the 1,012-seat Samuel Goldwyn Theater at the Academy’s headquarters in Beverly Hills, Calif. Covering these events was the perfect way to understand the categories, the crafts and meet the nominees. 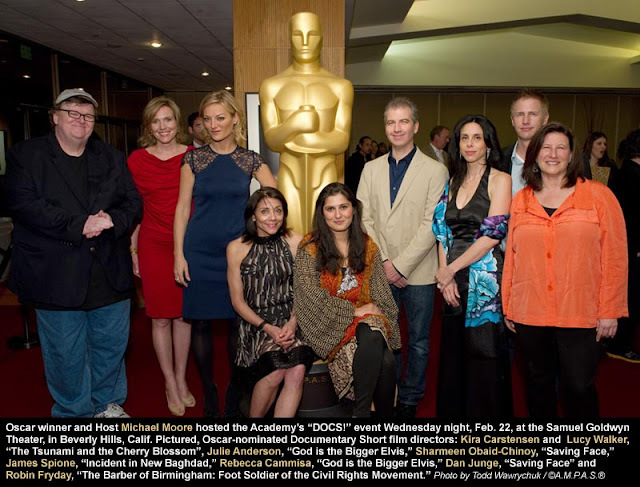 The documentary symposium, held Feb. 22, was hosted by Michael Moore, the Academy’s Documentary Branch governor. 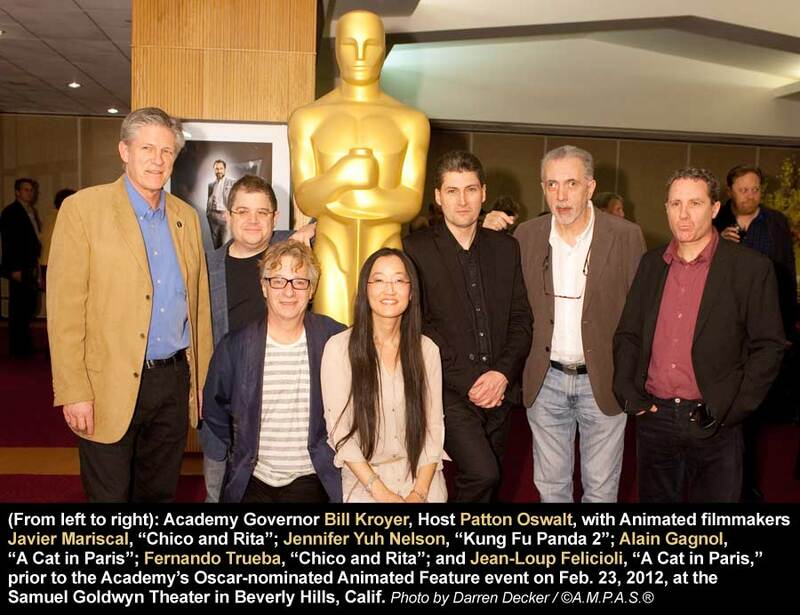 Here, directors and producers discussed the future, preservation and advancement of the craft. Daniel Junge, nominated with Sharmeen Obaid-Chinoy for “Saving Face,” said the short film format was perfect for their film. “Saving Face” tells a story of acid-attack survivors in Pakistan. The imagery is vivid and eye-opening. Junge said that if the film was too long, it could have anesthetized audiences. The effect of seeing the damaged faces needed to be done correctly, as to not numb the audience, he said. The film went on to win the Documentary Short Oscar. Feb. 23’s animation symposium was informative — and funny. Hosted by comedian Patton Oswalt, the evening featured three of the nominated films’ directors. Jennifer Yuh Nelson, director of “Kung Fu Panda 2,” discussed being an introvert and having to lead a team of 350 artists. The foreign language symposium, held on Feb. 25, fêted the five directors of films from Belgium, Canada, Iran, Israel and Poland. The directors discussed how their films were born. Asghar Farhadi, director of Iran’s “A Separation,” told the audience the movie started after he heard an Iranian song playing on a friend’s laptop. Farhadi was set to start another movie in Berlin, but the song reminded him of his native country. “I asked myself, ‘What am I doing?’” Farhadi said. He knew he needed to go back. The film went on to win the Foreign Language Oscar the next day. 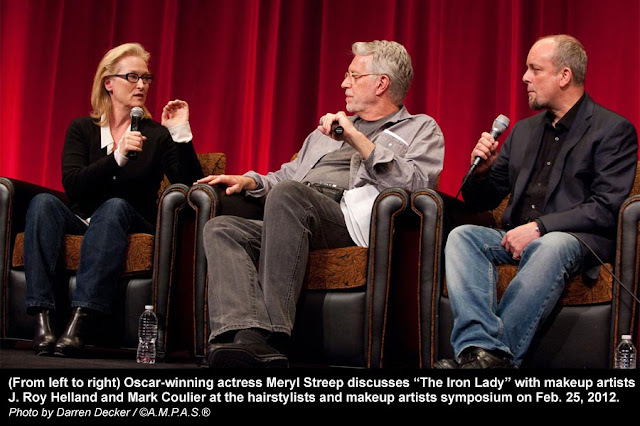 At the hairstylists and makeup artists symposium, also on Feb. 25, Glenn Close and Meryl Streep made surprise appearances in support of their nominated films. Close, nominated for “Albert Nobbs,” said she would have not done the movie without its makeup team. “The challenge for the team was to make it credible,” she said. The audience couldn’t know she was wearing makeup. The makeup team for “The Iron Lady” included J. Roy Helland, Streep’s personal hairstylist for 37 years. Streep said she was grateful for the team for its “masterful work” and how the makeup allowed her own appearance to come through. She didn’t want to look like an alien to herself, she said. The team went on to win the Makeup Oscar the next day. 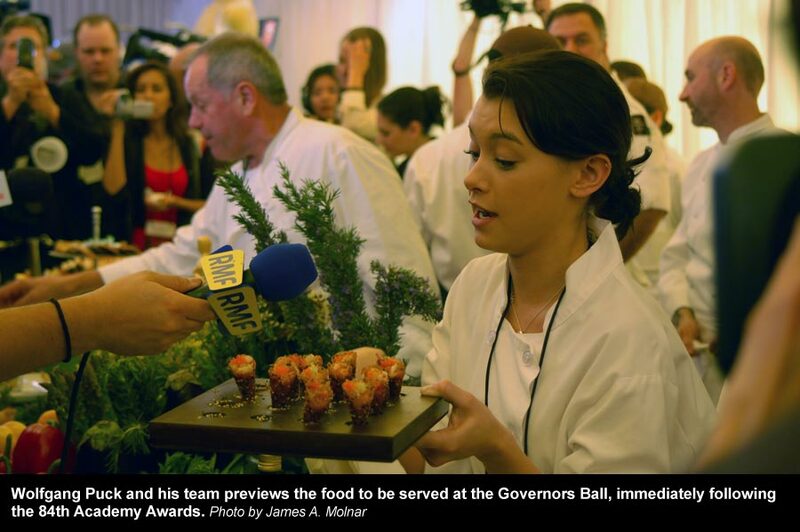 As a member of the press, I was also able to cover the food and beverage preview for the Governors Ball, which immediately follows the Oscars. Chef Wolfgang Puck and his team highlighted some of the food on which the invited guests would dine. Culinary creations included black truffle pizza and Kobe Beef Sliders. There was also a chance to talk to some of the Foreign Film nominated directors on Feb. 24. The two I was able to talk to — Michaël Roskmam (Belgium’s “Bullhead”) and Philippe Falardeau (Canada’s “Monsieur Lazhar”) — were both very happy to have their films selected by their countries to be represented at the Academy Awards. The whirlwind trip did not stop there. 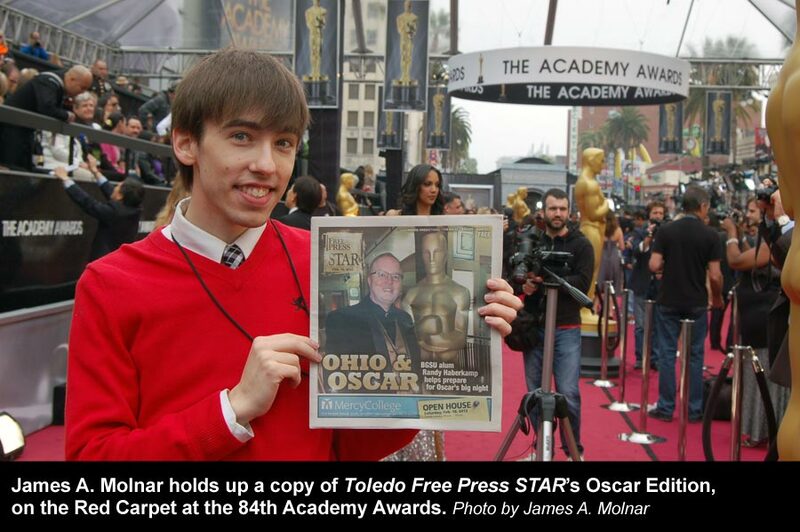 I was also able to meet Ohio native Randy Haberkamp, whom I profiled for the Feb. 15 Toledo Free Press Star and here on The Gold Knight Blog. He is the director of special projects at the Academy and was very gracious to share some of his stories and Oscars memorabilia with me. And then there’s the Red Carpet. 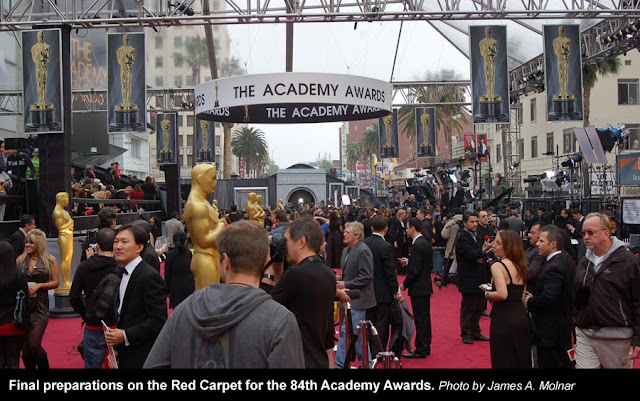 Hundreds of members of the press from around the world applied for credentials for access to the famous rouge carpet. Toledo Free Press (and The Gold Knight) was lucky to get a credential, although it did not include access right before and during the show. 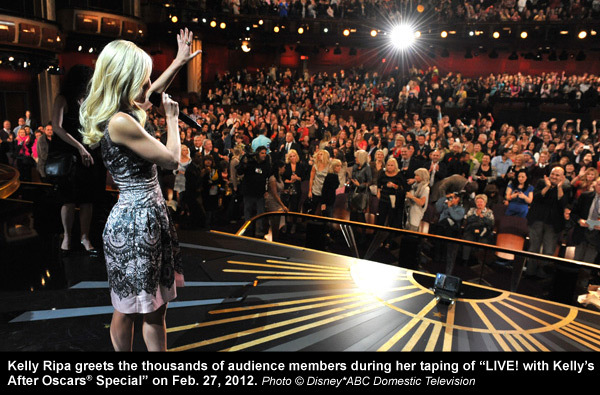 The Academy said that about one-third of applying media did not get a prime time credential. On Feb. 26, I was able to roam the Red Carpet until 11 a.m. I spoke with excited bleacher fans and other reporters who were also reporting on the atmosphere hours before the show. Early on Feb. 27, I was sitting in one of the plush seats an Oscars watcher had occupied just nine hours before. I was able to get tickets to “LIVE! with Kelly’s After Oscars Special.” Seeing the theater and the stage adorned with Oscar statuettes was a dream come true. While some of these events were exclusively for the press, others were open to the public. I am thankful to have gotten a credential for the Red Carpet, even limited, and lucky to have been able to secure tickets to the other events. If I learned anything during my week it’s that the Academy is here to celebrate the best in film — and it doesn’t want you to forget it. 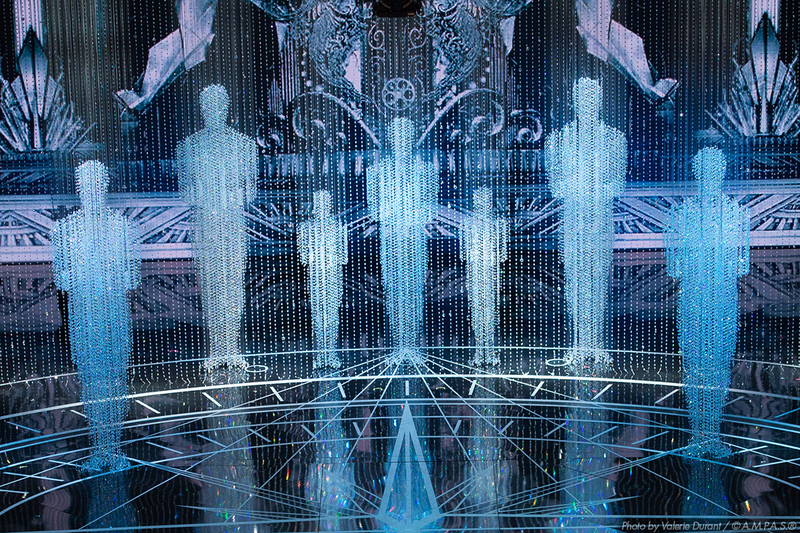 It also doesn’t close up shop once the curtain as gone down on the Oscar stage. It promotes the preservation and celebrate the best in film all year long, through events at its headquarters and around the country. But for this golden week, I’d like to thank the Academy for that.